Holen Sie sich einige R & R im komfortablen Sleepy Buffalo Cabin! Spektakuläre Ausblicke, 10 min. von Livingston, 15 min. In den Yellowstone River, 30 min. nach Bozeman, und 60 min. Yellowstone National Park. In der Nähe Blue-Ribbon-Forellenfischen, großen und kleinen Wildjagd, Wanderungen zu Wasserfällen, und vieles mehr! -Bunk Bett mit Doppelbett unten, Einzelbett oben. Bitte beachten Sie, dass eine Person muss lockern, um auf die obere Koje klettern werden! Log Etagenbett mit zwei Einzelbetten. Bitte beachten Sie, dass eine Person muss lockern, um auf die obere Koje klettern werden! -Die Gesamte Kabine ist tief gereinigt und alle Bettwäsche und Handtücher sind in zwischen jeder Gruppe von Gästen gewaschen. Sie können erwarten, eine unberührte saubere Kabine für Ihren Urlaub genießen! -Plenty Der Parkplatz vor der Hütte für Autos, Wohnmobile, Wohnwagen, Boote usw. The cabin was perfect for our fishing trip, well equipped, comfortable and a great location. Wouldn’t hesitate to recommend the Sleepy Buffalo Cabin, Aaron and Jessica were on hand if needed and very helpful. We enjoyed our stay at the sleeping buffalo cabin. The cabin is fully stocked, clean and well organized. It has everything you might need in the kitchen. Plenty of bedding, towels, and cleaning supplies. The cabin also has a laundry area and last but not least magnificent views. Thank you Aaron and Jessica for making our stay so comfortable. We definitely recommend staying at your place. We enjoyed our stay at the Sleepy Buffalo Cabin. It was outside of town and had great views. The cabin was clean and bright and was well stocked with everything you could possibly need. It felt like home. The owners were very helpful and concerned for our comfort. I highly recommend this property. This place had amazing views! We loved the rocking chairs on the front porch- went perfect with a glass of wine. It was very clean, and had absolutely everything you’d need on a vacation. The kitchen is stocked, the bathroom essentials are included, and the game selection was great. We will absolutely stay here again next time we’re visiting. The owners were very responsive when we had a quick question regarding the internet, and made us feel very welcome. This place was wonderful! This location is an absolute gem! Gorgeous views, comfortable accommodations and owners that truly care about your experience! It was about an hour of beautiful driving to access Yellowstone park and even less to great hiking and other Montana experiences. The cabin was comfortable and truly felt like a home away from home with all of the convieiences you would expect. Aaron and Jessica were great hosts and we would definitely stay here again! The Sleepy Buffalo Cabin is a great getaway on the Wineglass in Livingston MT. The views were magnificent. 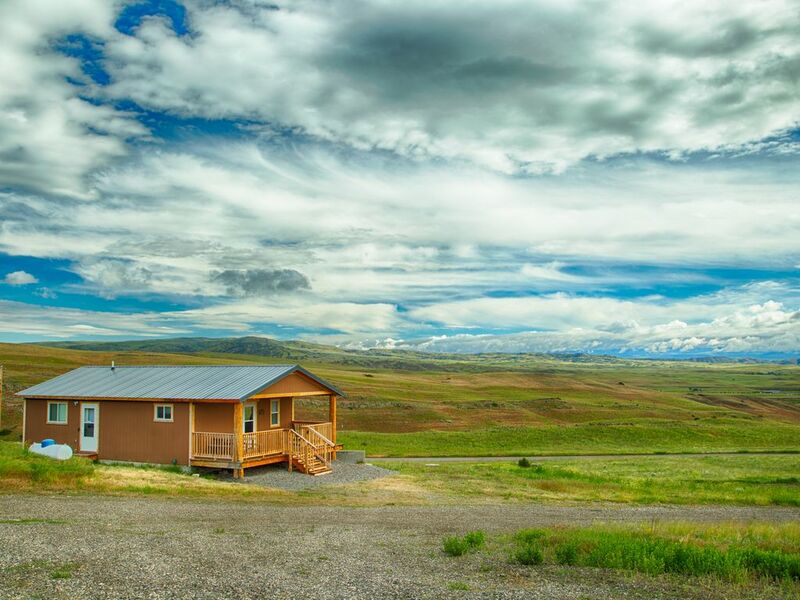 The cabin is spacious and has every amenity that you can think of. The hosts have supplied everything you need for a short or long stay. The cabin was very clean and well-kept. Aaron and Jessica are awesome and responsive hosts. When we had questions, they answered quickly. We highly recommend their property, and would definitely stay again. 50% of total is due upon booking, and 50% is due 30 days prior to Check-in. If booking 30 days or less prior to Check-in, full amount is due upon booking. Cleaning Deposit will be refunded if you complete the "Check-out Checklist." Damage Deposit will be refunded if there is no more damage than typical wear and tear. Check-in time is after 4 p.m. MDT and Check-out time is by 10 a.m. MDT.